DT & G Ltd Finn recently attended the India Food Service Forum at Mumbai Exhibition Centre promoting our products and commitment to the food industry. It was wonderful to see the wide range of products available in the Indian Food and Drink Industry. 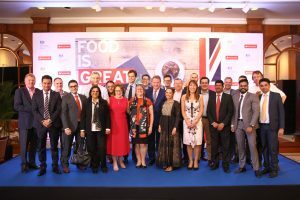 A Food and Drink Symposium was well attended at The Oberoi, Bangalore with excellent presentations and opportunity from all the companies for all the attendees to engage in positive discussions. It was great to be part of such a group. Special thanks go to Santander Bank, Department of International Trade India and UK, to Mr Ian Wright CBE and to AHDB Exports, Amber Glen Scotch Whiskey, Arbikie Highland Estate Distillery, Delamere Dairy, Provenance Brands, Green King, The Hop Studio, St James Smokehouse, Iceland, Trading World Ltd, The English Cheesecake Company and DeVine Distillates Group.